Deere will offer a factory-installed option of a new suspension track system in 60.96, 76.2 or 91.4 cm (24, 30 or 36 in.) belt widths. 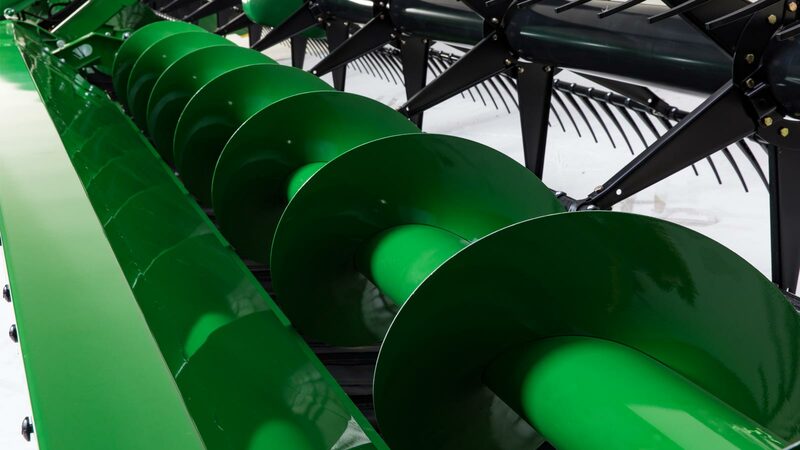 John Deere announces several updates to its grain harvesting solutions for 2019 that will significantly improve the performance, ride quality and small grain harvesting efficiency of its S-Series Combines. These additions include a new suspension track system, flex draper header and harvest-specific enhancements to the MyOperations™ mobile app. For model year 2019 S-Series Combines, customers have the factory-installed option of a new suspension track system in 60.96, 76.2 or 91.4 cm (24-, 30- or 36-inch) belt widths. 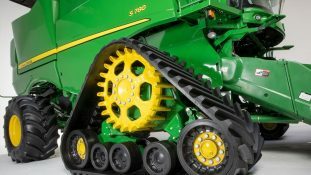 The redesigned John Deere track system for these combines incorporates changes to the track belts, integrated final drive, suspension cylinder and tandem bogie wheels that work together to improve floatation, ride quality, transport speed and durability. “Combines with these tracks will be able to get into paddocks sooner and harvest longer, especially under less than ideal conditions, with less impact on the soil,” says Matt Badding, product marketing manager for John Deere Harvest Solutions. The new track system features a unique tread design with wider and taller tread bars that are angled to improve traction, balance and ride comfort while extending tread life. And unlike previous track systems, combines equipped with the new track systems can travel up to nearly 40 kph (25 mph), reducing transport time between paddocks. In addition, Deere is launching the latest in its flex draper lineup – the 700FD HydraFlex™ Draper. This symmetrically designed draper has a dual V-guide belt and thicker, corrugated front edge for improved crop flow and four times longer belt life; dual position 40.6 and 45.7 cm (16- and 18-inch) centre-feed drum for greater harvesting versatility and better processing of bushy crops like canola; and a 45.7 cm (18-inch) Top Crop Auger for smooth feeding and fewer slugs under tough conditions. Lastly, to help customers more easily monitor combine operations and adjust settings from remote locations, Deere offers Remote View as part of the MyOperations mobile app. These new applications build on existing machine technologies, like Combine Advisor™ and Remote Display Access™, to allow owners or managers to remotely monitor combine performance and adjust concave clearance, rotor, fan speed and chaffer and sieve clearance settings as needed. “This latest mobile app for combines gives customers immediate visual access to machine information from a single combine or an entire fleet to improve overall harvesting operations. From their mobile device, customers can make changes to different settings as crop and harvesting conditions change throughout the day, then the operator simply accepts the changes on the in-cab display,” Badding says. He notes that the app is a great way for mangers to monitor less-experienced combine operators to ensure the combine is set and functioning properly. 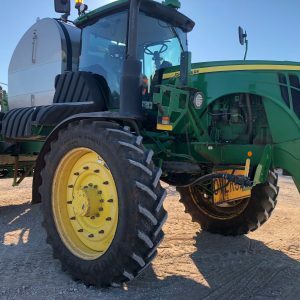 “These updates are fully integrated and compatible with John Deere S700 Series Combines, and continue to make them the most intelligent, efficient and productive grain harvesting machines for our customers,” Badding adds. 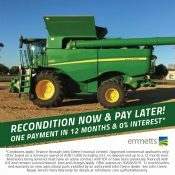 For more information on the new tracks, 700FD Drapers, mobile app and other harvesting equipment from John Deere, contact your local Emmetts dealership on 1 300 628 596.